This time I'm reviewing Admir Serrano's new book, Out and About. 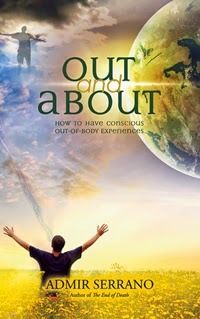 The subtitle is How to have conscious out-of-body experiences, so I had high expectations, but like too many books in the genre, the information was good but way too short. It's only 71 pages long, with a large font and small pages. That means you can read the whole thing in about an hour, maybe less. There's a lot that can be said about out-of-body experiences, but in my opinion, you just can't do it well in so few pages. Make mental and verbal suggestions, affirmations, and visualizations to train your subconscious mind and impress upon it your desire to have an OBE. This is common to many OBE books, even the earliest. Prior to sleep, as you fall asleep and enter the hypnagogic state, continuously repeat to yourself, "I am out of my body" and similar. I first remember reading this in Adventures Beyond the Body by William Buhlman, which I previously reviewed. Train yourself to become lucid/aware in your dreams. This is suggested by many books. Maybe the first was occultist Oliver Fox (aka Hugh Calloway) in his book Astral Projection from the 1920s. Program your subconscious to move out-of-body to your kitchen due to induced thirst and repeated walk-throughs. I remember reading this in The Projection of the Astral Body by Sylvan Muldoon from the 1920s. By the way, I don't recommend this method. There may be some merit, but dehydration is dangerous and can severely impact your health. On a positive note, Serrano does have a decent section entitled, "Key Points to a Conscious OBE" in which he talks about some important factors, such as: Desire, Action, Practice, Faith, Patience, Perseverance, Mental Suggestions, [Physical] Exercise and Relaxation. This section has several hints that are helpful (although not new or innovative). I'd say this is an average OBE book, with good information, but it's much too small to cover the topic well. The coolest part of this review is learning about OBE books that were written in the 20's. I had always thought from Monroe's comments that there wasn't much written before his first book. I'm gonna go look for Fox and Muldoon. Thanks for the education!